When some award is given to somebody the worth of the award itself gets multiplied! Here is such a news. 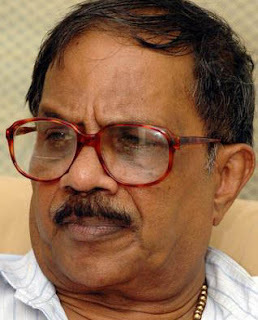 Eminent Malayalam writer M.T. Vasudevan Nair has been chosen for the Ezhuthachan Award, the highest literary prize instituted by the Kerala government. The award consists of a cash prize of Rs. 1.5 lakh, a citation and a memento. The cash prize is increased this year from previous 1 lakh. The Award jury, chaired by the most illustrious literary critic Dr. M. Leelavathi, decided to confer the honour on MT in recognition of his literary career spanning more than 50 years. The jury felt that the Ezhuthachan award had been long overdue to the 78-year- old writer, who had won the Jnanpith Award in 1995, for ‘Randamoozham’ ( Second Turn). MT had won the Kerala Sahitya Academy Awards for his novel ‘Nalukettu’ in 1958; drama, ‘Gopura Nadayil’ in 1982 and short story, ‘Swargam Thurakkunna Samayam’ in 1986. He had also been conferred with the Kendra Sahitya Academy Award for his novel ‘Kaalam’ in 1970. The late T.M. Jacob had instituted the Ezhuthachan Award when he was the Culture Minister in 1993 in memory of Thunchathathu Ramanujan Ezhuthachan, the father of literary tradition in Malayalam.